Our discounted rates are US$200/nt US$1,300/wk and US$240/nt US$1,580/wk Thanksgiving, Christmas, New Year's Day. BIENVENIDOS a Casa Escondida in Sayulita, your private and intimate tropical hideaway with private pool, garden, and views of the ocean, bay, and hills. "Escondida" means "hidden" and is an appropriate name for this small but elegant home. It is nestled in the hills and surrounded by a tropical garden. Consider yourself "lost" or "found" at this little retreat, which will be yours alone, where you can unwind, play, celebrate, or all of the above in an easy-going environment with beautiful views. Casa Escondida is located in the exclusive Pedregroso neighborhood on the quiet north side of Sayulita. 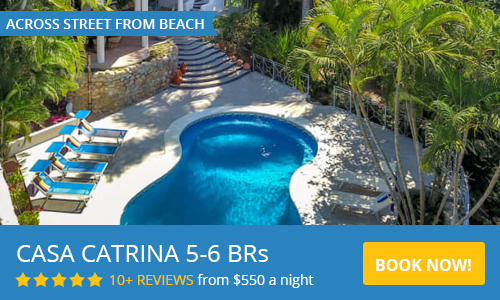 It is steps away from the most private and pristine end of Sayulita’s beautiful beach and within walking distance of the lively town center. After a 10-minute walk along the palm-lined beach or newly paved road you will find the first restaurants, shops, and surf break. Casa Escondida's proximity to the center of town is one of its attractions. It is close enough to walk to everything that Sayulita has to offer yet far enough to escape the hustle and bustle and find peace and tranquility. Casa Escondida accommodates a maximum of 3 adults or 2 adults with 2 small children. The large bedroom has a king-sized bed and a double-sized bed. The double is built into a nook and perfect for 1 or 2 small children, or for day-dreaming. The room is air-conditioned and stylishly furnished with handmade local furniture and regional artwork. The bathroom has a spacious walk-in shower and the open-air kitchen is modern and fully equipped. If you prefer not to cook and stay at home, arrangements can be made to have a delicious home-cooked meal delivered. The pool in front of the house is about 5' deep and includes a small wading/sitting/splash area. The patio is equipped with chairs, lounge chairs, and sun umbrella. Regardless of whether you are inside, outside, or in the pool you will have fabulous views of the ocean, bay, and sunset. The town of Sayulita is a charming, bustling fishing village, about a 45-minute drive away on Highway 200 through a lush mountain rainforest north from Puerto Vallarta. Tourism and a traditional pueblo life-style go hand in hand in this picturesque village. On the palm-tree lined beach you find lounge chairs and sun umbrellas for rent, beach cafés and restaurants, surf schools, and local fisherman who will take you fishing or bring you to pristine snorkeling areas. The ocean is great for splashing, swimming, and offers first-class surfing. Scattered through town are wonderful restaurants, many of them serving savory local dishes, others serving international cuisine such as Italian, French, Chinese, and Argentinean. There are boutiques, small grocery stores, internet cafes, a library, medical center, pharmacies, and a few family-operated tour operators offering jungle trips, mountain biking, kayaking, zip line adventures, horseback riding, visits to neighboring colonial towns and ancient pre-Columbian petroglyphs. In the center of town is a charming plaza where the locals and tourists linger in the evening. Depending on the season you may witness colorful fiestas and religious celebrations. 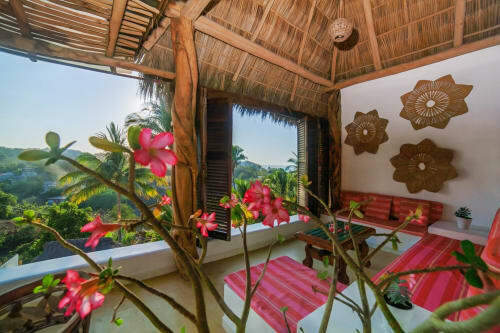 Beautiful SAYULITA is Mexico at its best and CASA ESCONDIDA simply complements this. Together they hold every promise for an unforgettable vacation and a perfect retreat to come back to year after year. Please contact us via the form with any questions and to request a reservation. My husband and I just got back from Casa Escondida and we loved everything about it! There’s tons of afternoon sun by the pool and it’s very lush and private. We can’t wait to go back! I can not say enough good things about this place!!! My boyfriend and I stayed for a few nights in Sept. We absolutely LOVED this casa! The view of the ocean is amazing! The landscape is really nice... So lush and green! We loved the pool. We spent a lot time in the pool. The kitchen is great, well-equipped with a cold pitcher of water in the fridge when we got there (Thank you!). Indoors, the bed is very comfortable and the A/C works really well! Everything was very clean and well kept. We will most definetely be back!!! I have not one single complaint. I was impressed with how nicely it has been kept up, the casa, the grounds and the pool. Even the kitchen was perfectly equipped for our home away from home. The staff was great and discreet in their attendance to allow for our sense of privacy and space. We look forward to staying here again! Our vacation could not have been more perfect! I hope we can continue to stay at Casa Escondida and this little paradise does not to get too busy. The location is quiet, private and beautiful. We only heard the Chachalachas (which are so funny!) and other birds and jungle sounds during our stay. Everything was very well kept, clean and comfortable. Maru was amazing and gave us great advice on where to eat, swim, and play. To many highlights, I would not know where to even start. The hardest part was saying good-bye - until we meet again Sayulita ! 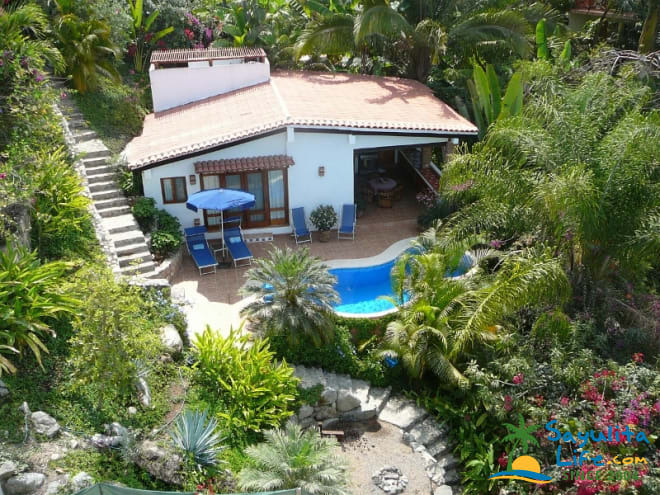 Casa Escondida is tucked away in a quiet residential neighborhood, perfect walking distance to the downtown Sayulita. A short hike through the jungle led us to a beautiful and private beach (Malpaso). The housekeeper and the pool person kept everything completely immaculate inside and out. Overall we spent a very relaxed, leisurely time in this charming home. Thank you for making us feel at home. My husband and I went to Sayulita to go to our son's wedding in March and there were about 27 family members who all rented different Casa's for the week. We are pleased to say that we liked ours the best! The location was great and we liked the fact that it was outside of town where it was quieter and the view was astounding. We rented a golf cart and that was definitely the way to go as the hills can be steep. The room of our casa was very comfortable and the air conditioning worked really well! Everything about the service was so well done from working with the owner, to the property manager, and also the housekeeping services were great. We couldn't have asked for a nicer place to stay and the overall setting of the village of Sayulita was a great place for a beach wedding. Everyone is so friendly there. Thanks for a memorable trip! My husband and I had the most amazing time at this Casa! It is beautiful, private and maintained to the highest standard. The house is private and the pool is wonderful. I can't recommend it enough. Iris and her team work very hard to make their guests happy and everyone was wonderful with us. We rented a golf cart before we got to Sayulita and in the end cancelled our reservation. While it's a bit of a steep hill up to the house, the walk from town is flat, either by road or our favorite route, by the beach! We loved this home, a well thought of floor plan, well appointed details and great bed. The gardens and pool are exceptional and the staff were excellent. We really felt at home here and all the details that were put into this home were appreciated. Good exercise coming up the hill! We were there for a week but would have loved to be there longer. The owner, Iris is great. She was very prompt with the inquiry, as well as any additional questions we had. The property manager, Marusa as well as her daughter Maria, were very helpful and so sweet. The house is so comfortable and clean. Beautiful pool and garden make the outside space so welcoming. The housekeeper and gardener keep the whole place immaculate. The kitchen is well stocked. There is a water purification system on the kitchen tap, which is a nice. Linens are great quality, and there are lots of beach towels. Thoughtful inclusions include a magnifying mirror and hairdryer in the bathroom, and a drying rack for wet clothes. The location was perfect, as it is just far enough from the town center to be quiet, and yet close enough to walk everywhere. Also, no barking dogs or roosters to be heard! If you have mobility issues, it might be a problem, as there is a large flight of stairs from the gate down to the casa, and the street it is on is very steep. We found no problems with this ourselves. We will for sure return. Thank you Iris for a great holiday. A slice of paradise, close to the fun, but not in the middle of it! We stayed for 2 weeks beginning Dec. 22, 2017. We have stayed in Sayulita in different places over the past 7 years. This spot is definitely sweet. Privacy, pool, a slice of ocean view, lovely garden and birds made the outside space great. Nice bedroom and bathroom. Comfy bed. Nice linens and towels. The kitchen, super clean, with large open arches to the 'jungle' was just fine. We didn't want to leave. US$250 Damage deposit, refunded in 2 weeks after departure less any damages to the property. A reservation is confirmed after receipt of the signed rental agreement and deposit, which is 50% of the total rent. The remaining balance and the US$250 refundable damage deposit are due 45 days prior to arrival. 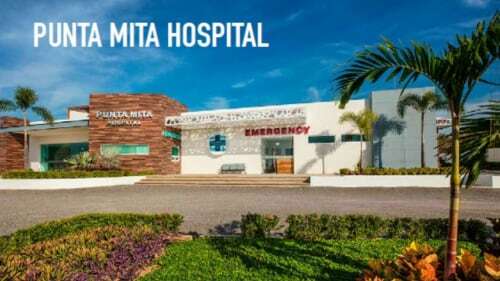 - Personal checks drawn from a US bank account; 1 for the deposit (50% of the total rental cost), 1 for the balance (due 45 days prior to arrival), and 1 for the damage deposit (due 45 days prior to arrival). The latter will simply be returned if there are no damages. - Paypal (often there is NO FEE). - Wire transfer from bank account to bank account. Sending bank and receiving bank will charge fees. Please ask for our bank details. - US$ Bank draft or US$ money order from a US bank or foreign bank. The issuing bank will charge a fee. Any Paypal or bank fees are deducted from the damage deposit. 5-Night minimum stay. Fewer nights are available when there are 4 or less nights available in between two confirmed reservations. Please check our online-availability calendar or feel free to ask. No smoking and no animals inside the house. We are a small family of three; Iris, Thom and son Max. Thom is from Cupertino, CA, a general contractor and founder of Hammerhouse Construction, Inc. Iris is from The Netherlands and has a background in finance. We love designing and building and are currently remodeling our 100+ year old fixer-upper in San Francisco, CA.When our son Max was only 3 months old we traveled to Sayulita for our first family vacation. At the very end of Calle Loma Linda we rented a vacation home with beautiful views of the ocean and an empty lot below ... It was 2002. We were in the midst of the financial crisis and there was no way then that we could afford to buy a home in San Francisco ~ not even a fixer-upper but maybe an empty lot in Mexico?We fell in love with Sayulita and kept wondering about that lot. We were in Sayulita for a week or so but before we left we were the proud owners of an empty L-shaped lot. Now the dreaming could start!In 2007 we built Casa Escondida on the top part of the L-shaped lot. A one-bedroom casita ideal for the three of us to stay. The dreaming continued and in 2012 we built Villa Yerbabuena on the lower part of the lot. When we designed and built our homes we always had the privacy, comfort and needs of our family, friends, and you, our guests, in mind. Both Casa Escondida and Villa Yerbabuena are available for rent and offer space to play, space to come together, and space to retreat. Nuestra casa es su casa!